2002 Touring treat Grand design. When it comes to affairs of the heart, logic and rationality take a back seat. 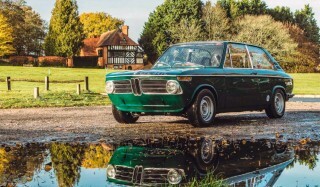 Paul Howse may design McLarens for a living but, as Dan Bevis discovers, there’s nowhere he’d rather be than in an old BMW… Photos: Alex Lawrence. The reasons behind our car buying decisions are many and complex. For some people – as hard as it may be for enthusiasts like us to believe – there’s little pleasure to be derived from driving, and a car is merely an appliance; this explains the number of Vauxhall Corsas that exist! For others, family safety is paramount, combined with a commanding road position, hence the inexorable rise of the SUV genre. People who buy performance cars have a very different set of priorities to those considering pick-up trucks, or electric city cars, or vans. There’s no all-encompassing answer to the question of why we choose to drive what we do; there are just too many variables. The 2002 Touring’s proportions do annoy Paul sometimes; he believes it just needs an inch or two shaved off the roof! But arguably, on paper, the ownership of a classic car makes the least sense of all. After all, these are cars that are less refined, less safe, less well-equipped and usually less powerful than their modern counterparts. Consequently, they bring with them a vastly increased likelihood of being left stranded at the side of the road, or presenting you with huge bills at MoT time. These, then, are machines bought with the heart, not the head. So how does this practical and artistic tension manifest itself within the aspirations of, say, the design manager at McLaren Automotive? Might such a person refuse to drive anything but a Senna or a P1, or perhaps follow Gordon Murray’s god-like pursuit of function, and zip about in an LCC Rocket? Paul believes that the 2002 Touring is such a charming thing, both to drive and to behold as a hunk of sculpture. “Having sold that first G15, I had a Mk1 MX-5 for about six months, before selling that to pay for my master’s degree.” Paul’s automotive adventures were really building a head of steam by this point. 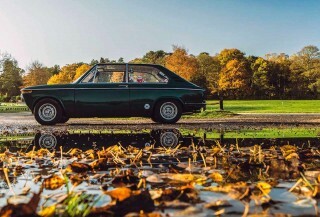 His then-girlfriend (now wife) handed over her Audi A3 but, after a few months he got bored and chopped it in for an Alfa Romeo GTV 3.0 V6. However, the colossal running costs and slightly disappointing driving experience soon saw the Alfa being replaced by a Peugeot 106 Rallye. This, in turn, made way for a Fiat Panda 100HP, before Paul again decided to change tack and sit himself in something a bit more classic – this time a car rather closer to our hearts, an E28 5 Series BMW. “I bought myself a beautiful one-owner E28 525e,” he beamed. “I owned that car for a year, before buying a Porsche 944 as I’d always wanted one for its big arches and pop-up lights. The trouble was that it was so dull to drive. Brilliant, but dull. And so I sold that and bought the 2002. Paul bought the 2002 Touring for its character and its design, and is very attached to the car. “I actually now think I prefer the Touring, as it’s a bit different. The proportions in side-view do annoy me sometimes, but from the front and back it’s ace… it just needs an inch or two shaved off the roof!” That’s the designer’s eye for you – but it’s the nature of human desire, each of us is perfectly imperfect, and that’s also true of our creations. 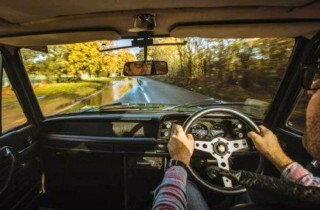 The Teutonic sensibleness of the 2002 certainly appealed, as Paul was keen to have a reliable classic he could run every day, including his 15-mile daily commute. He figured that a German car would be more ‘trustworthy’ than a French or Italian one, and you won’t hear any arguments from me on that point. So, with the 2002 Touring squarely in the crosshairs, Paul set about hunting down just the right example. The interior is pretty much standard, apart from the Momo Prototipo steering wheel and Recaro front seats. 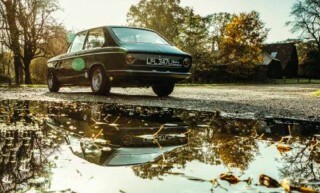 In due course, what seemed to be the perfect car presented itself for sale online, on the Car and Classic classifieds listing. It appealed due to having been restored, as well as being markedly cheaper than the 2002 saloons and, thus, dropping itself neatly into Paul’s budget range. 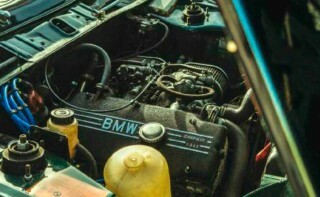 It also had twin carbs, and everyone knows that twin carbs are for winners, as well as natty front foglights and BMW E21 ‘turbine’ alloy wheels. “It seemed presentable and drove well,” Paul recalls. “The guy who’d restored it had done so by himself, and was an active member of the forum – so I took the plunge, much to my wife’s dismay. Although she now loves it, of course.” Well, naturally… who wouldn’t? The 2002 Touring is such a charming thing, both to drive and to behold as a hunk of sculpture, and the rakish fastback ticks all sorts of practicality boxes. There’s very little here not to love. Having firmly ticked the ‘buy a 2002’ box in late 2013, Paul’s initial impressions of his new purchase were exactly as rosy as you’d hope. 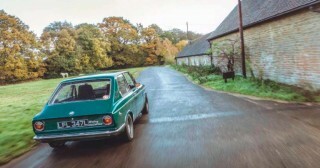 Sure, it wasn’t quite as fast or refined as some of the cars he’d previously owned, but it wasn’t meant to be; it was bought for its character, its design, and for that intangible reason common to all of us when we buy a random car that we can’t quite rationally explain – the heart wants what it wants. If the car’s right, it’s right. The new arrival wasn’t just splendid to look at either, Paul found it engaging, playful and fun, and was having a whale of a time with it… right up until it started falling to bits. “It has proper spirit and feedback, it looks awesome, and you get out of it buzzing, and smelling of unburnt fuel,” he grins. “It certainly made the commute more fun! A sudden loss of power was traced to a blown head gasket and finger-tight cylinder head bolts! “But then, after about two months, things started to go wrong, and I really started making use of the breakdown cover on my insurance. First of all the front, left wheel bearing seized – I thought the suspension had collapsed. It turned out that someone had only bothered to replace the outer bearing, as the inner was seized into place. Then, a few weeks later, it lost all power and it cut out. I limped into work and got towed home again. Luckily for me, my dad is an ex-racing car technician, and one of the most talented people I know. Without his expertise over the years, I’d never have been able to drive these old cars every day, and still afford to maintain them. Then, on the way home from the Goodwood Festival of Speed, the Touring decided to celebrate having witnessed a smorgasbord of exotic cars, by colourfully lunching its own gearbox, forcing Paul to limp home at little more than walking pace. Once the car was jacked-up he found – yes, you’ve guessed it – yet more loose bolts! This time it was the giubo between engine and gearbox which wasn’t fully bolted together; the giubo itself was in good nick and hadn’t failed, yet three of the nuts were missing and the remaining three were just about hanging in there. “It had a smashed a hole in the back of the gearbox casing, so I had to source another,” Paul remembers with a grimace. “I’d have liked a five-speed, but paying the over-inflated prices for one wasn’t an option. Luckily, motoring journalist, friend and fellow 2002 owner, Will Beaumont, came to the rescue, and gave me a four-speed ‘box he happened to have lying around. The car’s not been without its problems, but Paul couldn’t bear to part with it now. All of this might make 2002 ownership sound like a bit of a nightmare, but Paul’s keen to point out that the good times definitely outweigh the bad. Besides, this wouldn’t be any fun if it was easy, would it? If classic car ownership was as simple as buying a new Korean hatchback on finance then, surely, everybody would choose the prettier and classier option. In addition, the trials and tribulations he’s experienced have given Paul a chance to really get to know his car, as well as providing plenty of bonding time with his dad, who’s always eager to share his years of experience. “Anyway, I used the Touring every day for the first 18 months,” Paul continued, “although I couldn’t bring myself to use it over another winter, so it got semi-retired. The previous owner was an enthusiast who had restored the car himself. Unfortunately, a lot of important bolts were found just to be finger-tight! “I now play with it at weekends, and take it to classic car events like the Goodwood Revival and hill climbs. My children, who are aged three and five, absolutely love the car, so any excuse and it gets taken out. I’ve had a few things since to use as my daily driver, including an 5-Series BMW E28 M535i – which I definitely shouldn’t have sold! But the 2002 remains and, while it’s not as quick as the M535i or as stylish as some other cars I’ve owned, it’s got right under my skin and I couldn’t bear to part with it. Although there have been problems to deal with, the 2002 is running beautifully now, thanks to those extensive running repairs and Paul’s dad’s expertise. Indeed, since he flowed the ports a little while the head was off , the twin Dell’orto-equipped engine is producing a healthy 110-115bhp, and deploying it with gusto. The next step, then, will be to give the car the spruce-up it thoroughly deserves; 18 months of daily use means that the rust has started to bubble-up here and there and, of course, Paul’s professional eye can’t help but imbue a little healthy criticism. “I’ve started to strip it down so I can send it away and get it all done properly,” he assured me. “I’m using a friend who runs a paint and custom car shop in Essex, The Paintbox. Paul Howse may well be surrounded by McLarens every day, but there’s nowhere he’d rather be than in his classic 2002 Touring. You see, while there may be no rational reason for a McLaren designer to buy something like this, Paul’s ably demonstrated that rationality doesn’t enter into it. This is a car bought by and built on passion alone. And, by the sounds of it, he’s just getting started.